At Southcoast Health, we understand that proper care and treatment for a brain or spine condition starts with an accurate diagnosis and includes rehabilitation and follow-up. This is why we are proud to say that Southcoast Rehabilitation Services partners with Southcoast Brain & Spine Center to deliver the region’s only comprehensive site for the care of patients with neurological brain and spine disorders in southeastern Massachusetts and Rhode Island. Our outpatient functional spine clinic focuses on rehabilitation services for spine, neurological and balance disorders, as well as rehab for other injuries and conditions. The functional spine program features an expert team of rehabilitation professionals who are speciallty trained to work with patients with spine conditions. 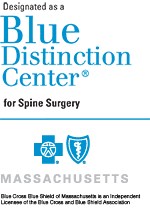 They work in close partnership with the Brain & Spine Center’s neurosurgeons, neurologists, physiatrists and pain management physicians who collaborate to provide patients with spinal physical therapy in Dartmouth, MA. Our spinal physical therapy offers multidisciplinary care, meaning that you will benefit from having a therapist who specializes in treating your injury or illness in addition to an expert neurologist. This allows us to offer our patients comprehensive and effective care and management for a wide range of brain and spine disorders, including epilepsy, memory disorders like Alzheimer’s, cancer and developmental disorders. Ask your neurologist at Southcoast if spinal physical therapy or another of our additional therapies could help you restore your quality of life. We can assure that you will receive expert care at our center, as well as an individualized treatment plan built for the best outcomes. Find a rehabilitation services location near you today. Southcoast Health offers physical therapy for spine and brain orders in Fall River, Dartmouth, New Bedford, Wareham, MA at Southcoast Brain & Spine Center.